Florida's upset winner in the Democratic gubernatorial race has embraced liberal policies. President Donald Trump, fresh off victory with Ron DeSantis, attacked Democratic gubernatorial nominee Andrew Gillum this morning, deeming him a "failed Socialist Mayor" who "allowed crime & many other problems to flourish" in Tallahassee. "This is not what Florida wants or needs!" the president said in an 8 a.m. tweet. "Donald Trump and Ron DeSantis are both scraping from the bottom of the barrel," Gillum said on CNN earlier in the morning, when asked if he was "scared" about Trump's role in the election. "I actually believe that Florida and its rich diversity are going to be looking for a governor who is going to bring us together, not divide us, not misogynist, not racists, not bigots. They are going to be looking for a governor who is going to appeal to our higher aspirations as a state." Gillum, 39 and the first black nominee for governor in Florida, has not identified as a democratic socialist but embraced the rising progressive wing of the party and adopted policies such as Medicare-for-All and abolishing Immigration and Customs Enforcement. He favors impeaching Trump. 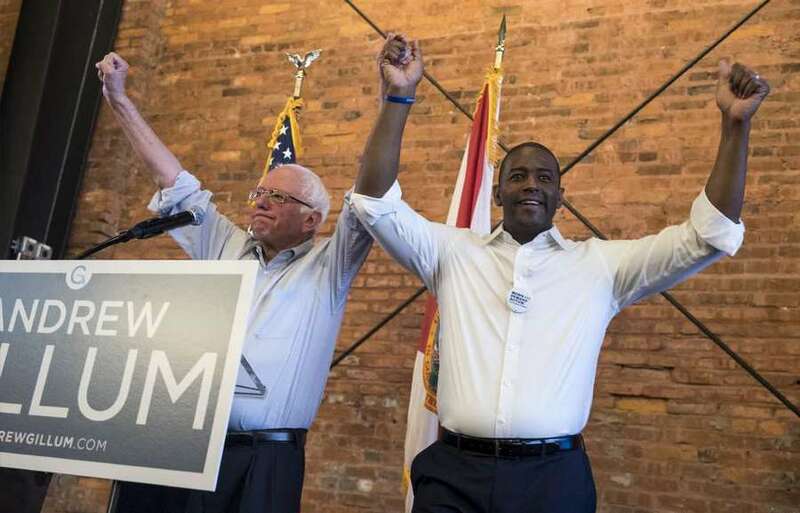 Gillum drew a late, crucial endorsement from Sen. Bernie Sanders, and Alexandria Osacio-Cortez, whose upset win in a New York Congressional race put democratic socialism on display, tweeted her congratulations last night — which DeSantis' campaign jumped on as "very helpful." "I am a Democrat and an individual in this state who believes that we've had a rough ride these last several years. People are working, many of them harder than ever, and still can't bring down a wage where they can make ends meet. And so I realize that these labels are easy to throw on folks, but when you're struggling — when you want to make sure that you can work one job instead of multiple jobs as a way to make ends meet — these labels mean nothing. And so what I'm standing for is what is the everyday, lived experience of the people in this state. And I believe they need a champion, too." Crime is an issue Gillum will face on the campaign trail. Tallahassee has seen a spike in violent crime and had a record number of homicides in 2017, leading Gillum to seek a state of emergency and to shift power to the county sheriff. But that proposal was rejected. The city has also been the subject of an FBI corruption probe. Gillum shrugged off the attack.